Maurice O’Carroll’s web series has picked up the award for ‘Best International Web Series’ at the NYCWebFest in New York. The series was also nominated in three other categories including ‘Outstanding Achievement in Editing’, ‘Best Actor’ (Johnny Elliott) & ‘Special Guest Star’ (Eddie Jackson). 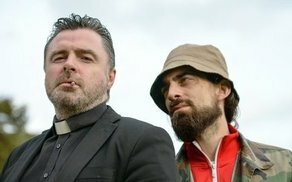 Written and directed by O’Carroll and produced by Sinead O’Riordan, ‘Sucking Diesel’ follows the journey of Fr. Mick (Elliott), a man trapped in his vocation and restricted in his thoughts and actions as he numbs his pain and loneliness by turning to drugs. He is dragged further into a dark underworld under the weight of an accumulated drug debt and news that his girlfriend (O' Riordan) is pregnant. With such heavy underlying themes, the series is balanced with an element of dark comedy. "We received several hundred entries for this year's NYC Web Fest. Sucking Diesel is clever, original, and very well performed and produced. I did my research when I watched the series and was shocked to find out it wasn't made with a large budget. Maurice O' Carroll & Sinead O' Riordan know how to tell a story and create 'something from nothing.' We pay attention to all of these factors when we make our decisions, and that's why Sucking Diesel is the Best International Series for the 2018 NYC Web Fest." ‘Sucking Diesel’ consists of four 10-12 minute episodes that are available to view online – here. "I'm thrilled absolutely thrilled with the award. I didn't want to follow my first feature film 'Dead Along The Way' with another no-budget effort that would take me on the same journey. I also didn't want to sit on my hands and wait for someone to hand me a magic suitcase of cash to make a second film. In fact, I wasn't even sure if I wanted to make that second film because Sucking Diesel was evolving into a TV show. A Webseries felt the right choice of project for many reasons:it is relatively uncluttered space where we could stand out, we could offer interested studios a flavour of what to expect from the TV show, and Youtube offered us an immediate and global audience." "Sucking Diesel has been fleshed out into a 6-part TV series and also adapted as a feature film. The proposed TV series was considered by Sony WorldWide TV and, although they eventually passed on it, we have been referred to three London based producers who might be a better fit for the project. When one door closes, three more open! However we are also only too aware of how fickle the industry is, so we are willing to continue its journey ourselves and set out to bring this to your TV screens." ‘Sucking Diesel’ is available FREE to view on Youtube for a limited time.